Twenty years long of war, twenty years long of tears. It is really so hard for the youth today to know the facts of this tearful war of the past. But it is something worth learning, by means of the songs from Trinh Cong Son, to understand as much as possible the pain from war at that time. What happened for people, how much sad people stood, what disasters this war forced the country to? If the life ever ask yourselves the questions like that, because the country is your motherland, and because those people might be your grandparents, your parents, your brothers, your sisters, or your friends’ relatives. Most of those people are the people of the older generations who quit the scene. Who would tell you the reliable story? Songs Trinh Cong Son composed for the theme “Country” of his songs would tell you a lot of the valuable facts, the remarkable events, and the strong images of the painful war. The facts he said, the events he wrote, the images he shot maybe not something recorded by the historians, or did speaking by the politicians. What he a witness, a musician, an artist said, he said what his human heart said, what a normal Vietnamese said, what his emotion could not stop to move to tears. 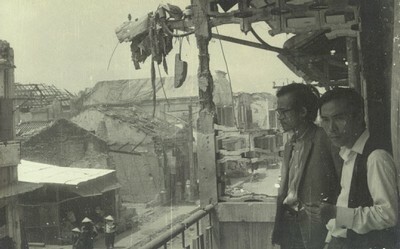 At the wartime in Vietnam, nearly no day calm for Vietnamese. There were the clashes somewhere per day. There are dead and wound somewhere per night. Threats may be on the watch and aim at any family from anywhere. People did not live in peace but in worry, day after days, month after months, year after years. Initially, it might be the pain of some small groups of people who suffered directly from the conflicts in the early years of the war. The pain had become too big later and expanded to the other larger groups. It became the pain of the big families, the pain of the larger communities, the pain of more than one party, the pain of more than one nation. It broke out and once became the pain of the world, the pain of the human conscience, of the people who still love people. 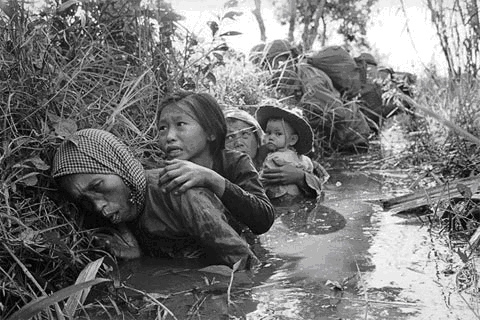 However, almost the dead bodies still were the Vietnamese ones, and the most painful pain still belong to the poor Vietnamese people who were loudly called the ones to be protected, the ones the different sides fighting for. No matter what the words of political standpoints said, these millions of bodies from sides had no chance to say any word to defend themselves through the periods of decades. Fighting happened everywhere. It climbed up and down the mountain. It trampled upon the wet land and the dry land. It swept over on the fresh-seeds field and the harvested field. It rained down outside and inside the towns. The guns did not differentiate where the battlefield or not. The shells had no time to learn the sense of mercy for the bodies came from the school, hospital, temple, or church… It did not give up any space for the humanitarian reason. All places could strangely become the deadly battlefront. Fighting happened every time, sun and rain, day and night, month after month, dry season then wet season, year after year. Gun and ammunition threaten everyone. The echo of sounds of bomb and canon and mines and the others may come from any direction. It may appear above the head, under the feet, and around the ears. The fear comes from inside and outside the heart. Enemy seems appearing everywhere. People did not trust people. People looked at people with suspicion. People may see nearly everyday with their own eyes the different ways of sudden dead of the relatives, friends and fellow-citizens. Irrespective of men or women, soldier or civilian, adult or children, millions of people killed, millions wounded, millions disabled forever. Countless people displaced for years, taking refugee somewhere far from their home too many years. The sadness was too sad to call. The darkness was too dark to say. The pain was too painful to cry. The fear was too often to try to escape. The hope sloped closer to the hopelessness. The bad situation lasted too long to keep patient to wait. Somewhere people had gone to crazy. “Song for the Bodies”, “Long Day of My Country”, “Lull the Night by Shells”, so on are the stories from musician Trinh Cong Son, who is one of the important witnesses of the war in the 20th century of the country. His stories are not the emotionless stories tell us something dry, or something use for a purpose of self-seeking. On the contrary, his stories are the emotional songs that tell us the valuable lessons of peace, the lessons from the war, the lessons of love, and the lessons from hostility. These lessons somewhere did wake up people together to see the fact of bloodshed, to find out the way to escape the harsh condition people suffered during the period of war and postwar, to find out the way to sit down together to talk in peace instead of cool shoot together so long like that, the time of more than twenty years. Trinh Cong Son, an extraordinary musician, he has composed all his life for the world of love - human love. Trinh Cong Son, the special bird, he has sung the songs by his full heart, by an ardent love for the fellow creature, for human life. However, what the reward he received was not all the love. Beside the big love from millions of people who loved his songs, it did not exclude the complaint, the misunderstanding from the various people during the war time and even far after the war ended years. Times, he became the goal to be criticized by the different groups of faction. One example: See, with the single song “Lull the Night by Shells”, Trinh Cong Son was condemned by the different sides. They considered him as the man of the other side, the supporter of their enemy. No side sounds please his position of the songs. Read these paragraphs of the song below, in which, it made people of one side think that the song accused its side’s force who fired the shells to the town. These thought: “Man who accused our side using the shells during the fighting is exactly the man of other side – our enemy”. And read these other paragraphs below of the same song, in which, it caused people of the second side’s force shocked that the song accused them who used warplanes during the war. These thought: “Man who accused our side using the warplanes during the fighting is exactly the man of the opposite side – our enemy”. Who know this situation he had reluctant stood inside? When his heart didn't belong with the room of dark walls, his heart was flying outside in the bright sunshine sky. He was very anxious coming here from a different space - a space which was quite strange to this room. Nowhere here is really for him. He belongs to the others. He had often to leave the room to sit quietly somewhere else, at a quiet place, where the Hearts have ever sat. Return alone with me ..
After the rain, the sun shines. When the dark over, the light comes. Beyond hopeless, the hope appears.